I’d noticed that the bandwidth for my podcast was being rapidly used up over the last week, and I was wondering why the number of downloads was suddenly rocketing…. 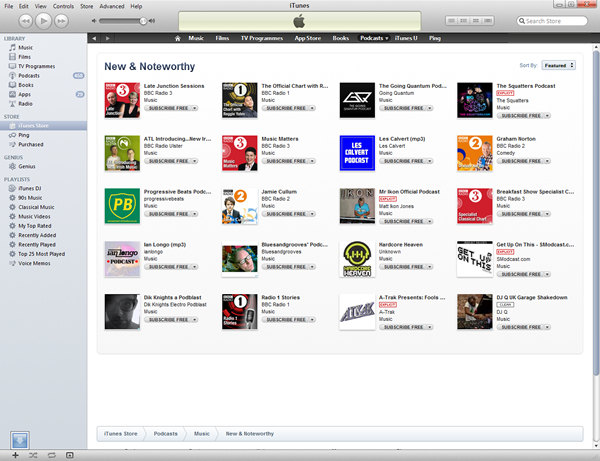 So, after trawling the web a bit this morning I happened to look at iTunes and much to my amazement the ProgressiveBeats Podcast is featured in the “New and Noteworthy” section (they don’t send you an email or anything to tell you), one of only 20 music podcasts listed there at the moment! That’s incredible :-), no wonder its using over 2Gig of bandwith per day!! Thanks to everyone who has downloaded it so far. I’m working on another episode at the moment and I’ll be updating this site with lots of lovely content over the coming weeks. Stay tuned! Not subscribed yet? Use the iTunes link at the top of the page.